He soon gained the reputation of a useful and capable officer, and it was through Robespierre’s younger brother that he got his first chance of distinction at Toulon. Toulon had been handed over to the British and Spanish by the Royalists, and a tallied fleet occupied its harbor. Bonaparte was given the command of the artillery, and under his direction the French forced the allies to abandon the port and town. He was next appointed commander of the artillery in Italy; but he had not taken up his duties, when the death of Robespierre seemed likely to involve his own; he was put under arrest as a Jacobin, and for a time he was in danger of the guillotine. That danger passed. He was employed as artillery commander in an abortive raid upon Corsica, and then went to Paris (1795) rather down at heel. Madame Junot in her Memoirs describes his lean face and slovenly appearance at this time, «his ill-combed, ill-powdered hair hanging down over his gray overcoat», his gloveless hands and badly blacked boots. It was a time of exhaustion and reaction after the severities of the Jacobite republic. «In Paris», says Holland Rose, «the star of liberty was paling before Mercury, Mars, and Venus» finance, uniforms, and social charm the best of the common men were in the armies, away beyond the frontiers. We have already noted the last rising of the royalists in this year (1795). Napoleon had the luck to be in Paris, and found his second opportunity in this affair. He saved the Republic of the Directory. His abilities greatly impressed Carnot, the most upright of the Directors. Moreover, he married a charming young widow, Madame Josephine de Beauharnais, who had great influence with Barras. Both these things probably helped him to secure the command in Italy. We have no space here for the story of his brilliant campaigns in Italy (1796-97) but of the spirit in which that invasion of Italy was conducted we must say a word or two, because it illustrates so vividly the double soul of France and of Napoleon, and bow revolutionary idealism was paling before practical urgencies. He proclaimed to the Italians that the French were coming to break their chains and they were! He wrote to the Directory: «We will levy 20,000,000 francs in exactions in this country; it is one of the richest in the world». To his soldiers he said, «You are famished and nearly naked … I lead you into the most fertile plain in the world. There you will find great towns, rich provinces, honor, glory, riches . . ». We are all such mixed stuff as this; in all of us the intimations of a new world and a finer duty struggle to veil and control the ancient greeds and lusts of our inherited past; but these passages, written by a young man of twenty-seven, seem to show the gilt of honorable idealism rubbed off at an unusually early age. These are the bribes of an adventurer who has brought whatever impulse of devotion to a great cause once stirred within him well under the control of his self-love. His successes in Italy were brilliant and complete; they enormously stimulated his self-confidence and his contempt for the energy and ability of his fellow creatures. He had wanted to go into Italy because there lay the most attractive task he had risked his position in the army by refusing to take up the irksome duties of a command against the rebels in La Vendée and there are clear signs of a vast expansion of his vanity with his victories. He had been a great reader of Plutarch’s lives and of Roman history, and his extremely active but totally uncreative imagination was now busy with dreams of a revival of the eastern conquests of the Roman Empire. He got the republic of Venice out of his way by cutting it up between the French and Austria, securing the Ionian Islands and the Venetian fleet for France. This peace, the peace of Campo Formio, was for both sides a thoroughly scoundrelly and ultimately a disastrous bargain. The new republic of France assisted in the murder of an ancient republic Napoleon carried his point against a considerable outcry in France and Austria got Venetia, in which land in 1918 she was destined to bleed to death. There were also secret clauses by which both France and Austria were later to acquire south German territory. And it was not only the Roman push eastward that was now exciting Napoleon’s brain. This was the land of Cæsar and Cæsar was a bad example for the successful general of a not very stable republic. Cæsar had come back to Rome from Gaul a hero and conqueror. His new imitator would come back from Egypt and India-Egypt and India were to be his Gaul. There was really none of the genius about which historians write so glibly in this decision. It was a tawdry and ill-conceived imitation. The elements of failure stared him in the face. The way to Egypt and India was by sea, and the British, in spite of two recent naval mutinies, whose importance Napoleon exaggerated, were stronger than the French at sea. Moreover, Egypt was a part of the Turkish Empire, by no means a contemptible power in those days. Nevertheless he persuaded the Directory, which was dazzled by his Italian exploits, to let him go. An Armada started from Toulon in May 1798, captured Malta, and had the good luck to evade the British fleet and arrive at Alexandria. He landed his troops hurriedly, and the battle of the Pyramids made him master of Egypt. The main British fleet at that time was in the Atlantic outside Cadiz, but the admiral had detached a force of his best ships, under Vice-Admiral Nelson as great a genius in naval affairs as was Napoleon in things military to chase and engage the French flotilla. For a time Nelson sought the French fleet in vain; finally, on the evening of the first of August, he found it at anchor in Aboukir bay. He had caught it unawares; many of the men were ashore and a council was being held, in the flagship. He had no charts, and it was a hazardous thing to sail into the shallow water in a bad light. The French admiral concluded, therefore, that his adversary would not attack before morning, and so made no haste in recalling his men aboard until it was too late to do so. Nelson, however, struck at once against the advice of some of his captains. One ship only went aground. She marked the shoal for the rest of the fleet. He sailed to the attack in a double line about sundown, putting the French between two fires. Night fell as the battle was joined; the fight thundered and crashed in the darkness, until it was lit presently by the flames of burning French ships, and then by the flare of the French flag-ship, the Orient, blowing up … Before midnight the battle of the Nile was over, and Napoleon’s fleet was destroyed. Napoleon was cut off from France. Says Holland Rose, quoting theirs this Egyptian expedition was «the rashest attempt history records». 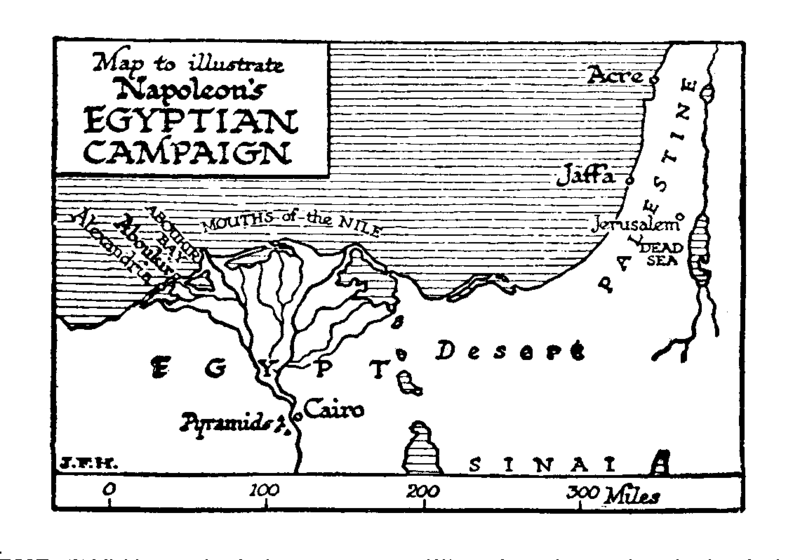 Napoleon was left in Egypt with the Turks gathering against him and his army infected with the plague. Nevertheless, with a stupid sort of persistence, he went on for a time with this Eastern scheme. He gained a victory at Jaffa, and, being short of provisions, massacred ail his prisoners , Then he tried to take Acre, where his own siege artillery, just captured at sea by the English, was used against him. Returning baffled to Egypt, he gained a brilliant victory over a Turkish force at Aboukir, and then, deserting the army of Egypt it held on until 1801, when it capitulated to a British force made his escape back to France (1799), narrowly missing capture by a British cruiser off Sicily. Here was muddle and failure enough to discredit any general had it been known. But the very British cruisers, which came so near to catching him, helped him by preventing any real understanding of the Egyptian situation from reaching the French people. He could make a great flourish over the battle of Aboukir and conceal the shame and loss of Acre. Things were not going well with France just then. There had been military failures at several points; much of Italy had been lost, Bonaparte’s Italy, and this turned men’s minds to him as the natural savior of that situation; moreover, there had been much speculation, and some of it was coming to light; France was in one of her phases of financial scandal, and Napoleon had not filched; the public was in that state of moral fatigue when a strong and honest man is called for, a wonderful, impossible healing man who will do everything for everybody. People, poor lazy souls, persuaded themselves that this specious young man with the bard face, so providentially back from Egypt, was the strong and honest man required another Washington. With Julius Cæsar rather than Washington at the back of his mind, Napoleon responded to the demands of his time. A conspiracy was carefully engineered to replace, the Directory by three «Consuls» everybody seems to have been, reading far too much Roman history just then of whom Napoleon was to be the chief the working, of that conspiracy is too, intricate a story for our space; it involved a, Cromwell like dispersal of the Lower House (the Council of Five Hundred), and in this affair Napoleon lost his nerve. The deputies shouted at him and hustled him, and he seems to have been very much frightened. He nearly fainted, stuttered, and could say nothing, but the situation was saved by his brother Lucien, who brought in the soldiers and dispersed the council. This little hitch did not affect the final success of the scheme. The three Consuls were installed at the Luxembourg palace, with two commissioners, to reconstruct the constitution. With all his confidence restored and sure of the support of the people, who supposed him to be honest, patriotic, republican, and able to bring about a good peace, Napoleon took a high hand, with his colleagues and the commissioners. A constitution was produced in which the chief executive officer was to be called the First Consul, with enormous powers. He was to be Napoleon; this was part of the constitution. He was to be, re-elected or replaced at the end, of ten years. He was to be assisted by a Council of State, appointed by himself, which was to initiate legislation and send its proposals to two bodies, the Legislative Body (which could vote, but not discuss) and the Tribunate (which could discuss, but not vote) which were selected by an appointed Senate from a special class, the «notabilities of France», who were elected by the notabilities of the departments», who were elected by the «notabilities of the commune», who were elected by the common voters. The suffrage for the election of the notabilities of the commune was universal. This was the sole vestige of democracy in the astounding pyramid. This constitution was chiefly the joint production of a worthy philosopher, Sieyès, who was one of the three consuls, and Bonaparte. But so weary was France with her troubles and efforts, and so confident were men in the virtue and ability of this adventurer from Corsica, that when, at the birth of the nineteenth century, this constitution was submitted to the country, it was carried by 3,011,007, votes to 1,562, France put herself absolutely in Bonaparte’s hands and prepared to be peaceful, happy, and glorious.